Fayette Garden Club members (left to right) Jodi Kirkpatrick, Pat Parsons and Marjorie Clifford looking over the plant and seed exchange table. Members of the Fayette Garden Club met at the home of Pat Parsons with assisting hostess Mary Estle for their September meeting. President Pam Rhoads opened the meeting with a poem entitled “Picking Berries,” by Robert Emmet Monigal. Roll call was answered by each member naming a vine. Some of the vines mentioned were Ivy, Silver Lace vine, trumpet vine and Passion Flower. Secretary Susie Meriweather and treasurer Debbie Carr read their reports and they were approved as read. The upcoming Region 16 meeting to be held in October at Caesar’s Creek was discussed. Birthday greetings were extended to Shirley Johnson, Linda Morgan, Pam Rhoads and Marge Clifford. Plant of the month was the Silver Lace Vine. This vine is a fast growing, deciduous vine that grows approximately 10 feet in length in one season. The plant is native to China and is hardy in USDA growing zones four through eight. Silver lace vine produces bright green foliage with small, fragrant flowers that range in color from light green to white with a pink tinge. The vine can become invasive when not pruned on a yearly basis to control growth. The silver lace vine that the Meriweathers have in their garden is from a plant exchange from Dorothy Self’s garden. The golden rod and butterflies were a topic that was discussed between the members. Pat Parsons told about the golden rod being a source of nectar for many species of butterflies. She also told about bees gathering pollen from the golden rod plants to make honey. This honey is very light in color and tasty. Susan Meriweather added that there are 12 variations of the deep yellow golden rod color which are now used to describe paint colors. Golden rod also has medicinal uses – one being a diuretic. A white elephant sale and plant and seed exchange were held. All members enjoyed exchanging seeds and plants. Pat and Mary served a delicious blackberry cobbler made with blackberries from Pat’s garden. Also, ice cream, nuts and snacks accompanied the dessert. Members attending were Vicki Cardenas, Debbie Carr, Marge Clifford, Mary Jane Esselbourne, Mary Estle, Julia Hidy, Jodi Kirkpatrick, Connie Meriweather, Susie Meriweather, Joanne Montgomery, Pat Parsons, Pam Rhoads and Jean Smith. 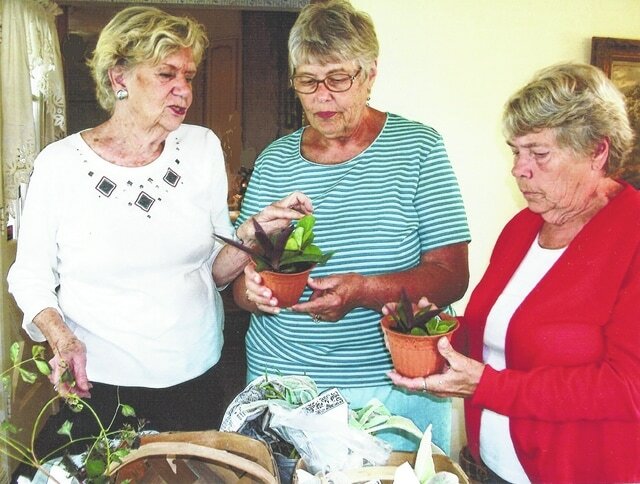 https://www.recordherald.com/wp-content/uploads/sites/27/2016/09/web1_PlantExch9-16-3-1-.jpgFayette Garden Club members (left to right) Jodi Kirkpatrick, Pat Parsons and Marjorie Clifford looking over the plant and seed exchange table.